I bought a large bag of beautiful, dark red plums from the fruit markets, but when I got home, they turned out to be quite tart. No one was very keen to eat them, so I decided to put together a delicious plum crumble for my family. The plums were pretty sour, so I had to use a few spoonfuls of maple syrup to sweeten them up. 1. Set your your oven to 160ºC/350ºF. 2. Whiz the flour and butter together in a food processor (with pastry blade) until it resembles breadcrumbs. Toss in oats, coconut, almonds, sugar (if using) and whiz until just combined. Set aside. 3. 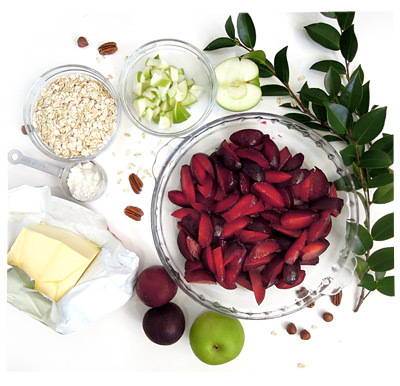 Chop the plums into chunky slices. Arrange in a large pie dish (25cm diameter). Finely dice the apple and sprinkle on top, along with the vanilla and maple syrup. Give the fruit a good stir with a big spoon. 4. Heap the crumble evenly over top of the fruit. Bake for 30-40 minutes, or until golden brown. Serve hot, with ice cream, yoghurt or crème fraîche. « Happy Chinese New Year!